On a side note, it seems like there are almost no LSiM left in Canada. Bestbuy sells 703 and 706, but nothing else. Good thing I've got my 705, even if I honestly paid too much. 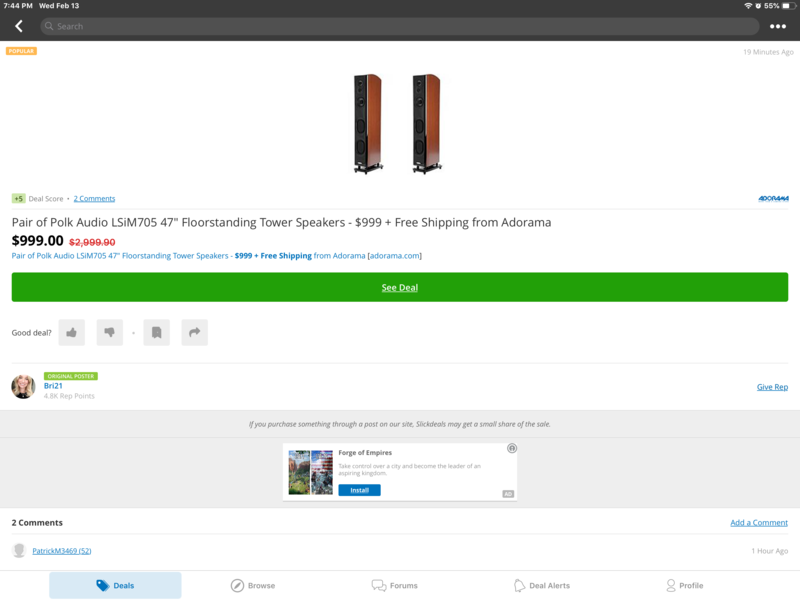 As for Canucks who would be tempted to buy smaller speakers from Adorama. I bought a 704c, and with prepaid duties, it was a breeze. No surprise brokerage fees. I also ended up with a 10% partial refund because they sent me an open box, which is more than I expected. ^^I dislike cherry as well, reminds me of Grandmas house. I sure wish the MM would be included. Those LSiM705's look interesting. Any opinions on whether these would be an upgrade or just a lateral move from my ML ESL's? I know they would be very different, to say the least. MSRP aside (and even there), those two are just way too different to be compared directly, but you already know that... . Last time I heard a pair of ML was at least 6 or 7 years ago, so I'm quite out of phase and won't comment on these. The 705s are great neutral speakers, but as such, it's possible that they won't invite you to dance. When set up properly, they will reproduce music fairly well, but as some reviewer said a few years back, they tend to be quite polite and in my opinion and experience over the last five years, that's exactly how I would describe the LSiM 705 if I had to do so in one word. I like them because I'm more into background music these days (e.g. I will always do something else while listening to music), and the LSiM line won't sound bad if you're not necessarily in the sweet spot, but they're not party poppers. Long story short, judging by the overall quality of the ML, it would definitely be a lateral move, and maybe not a good one at that as it really depend on your tastes. You could give them a try, but I don't know about Adorama's return policy. Yeah, I think maybe just adding a nice little subwoofer to these might be the better move....thanks. I've heard the ML in Magnolia and the 705's definately have more bass. Did not spend enough time to form a real opinion on them. But I'm extremely happy with my Polk 705's they are balanced. I think to get the most out of them you might need some amplification. I always pop in Blade Runner 2049 for testing and they don't dissapoint in the bass department. I did run room correction and run them as Large along with a Polk 706c for center as Small with 80hz crossover. If space is an issue and you dont want to add a subwoofer then definately worth a look. That last pic is a 24" open baffle subwoofer! Its supposed to be the ultimate for planer type speakers. The Emerald Physics OB-SW24 was introduced at the Axpona 2018 show. It is a state of the art open baffle folded box design with a 24" XBL2 subwoofer driver. The driver has a 46mm one way X-Max. The sub will come with a digital room correction device from DSPeaker as well as outboard 450 watt Emerald physics power amplifier. We are rating this sub to do 125Db at 10Hz in room as a preliminary spec. 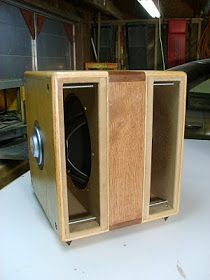 This will be the ultimate subwoofer for any planar speakers like our EP2.8 as well as large Magnepans and Martin Logans. It will also work with any other high end large scale speakers.The size is 24" wide x 48" high and 48" deep. The woofer is using 13 ply Baltic birch with a rosewood/ebony veneer over it. Thanks. This would be strictly for 2-channel music in a 10' x 19' x 9' dedicated room. How much space do you have? It just seems so natural that a Dipole , line array, etc. sub system would be so right for electrostatics. Some of what Linkwitz has done would probably be amazing. Ha ha....hmmm. Nice but probably overkill for me. It's a small, dedicated room 10' x 19' and 9' ceiling, 2-channel only at moderate levels. I'm thinking something sealed with an 8" driver might be the best match. ML makes some that are supposedly engineered to match the speed of electrostats but out of my budget. Right now I'm thinking something under $500-ish? What ML do you have? I'm a sealed sub guy but an 8" sealed seems small for the job. GR research has some open baffles kits but they are outside of your budget. With open baffle, you need more driver surface area to move air. Don't let size fool you. The right 15" open baffle sub can sound just as clean and articulate as some ported 8" subs. Most of these would be DIY options. Maybe consider one of the 12" Rythmik Audio L series subs? or a 10" or 12" Dynamo? I'm fond of the HSU ULS-15 for a musical sub, but its more money. Electromotion ESL's. I say 8" as that matches the driver size in the ML's and I was thinking the smaller, the faster. And again, strictly for nice tight musical bass. I don't care about shaking the room :^ ) I was looking at those Rythmic subs just last night. This is how I see it. I'm a fan of sealed subs and I have used small 8" and 10" subs before in the home, car music focused systems. However, take a LARGE radiating surface like the Electromotion ESL panels and 8" high excursion drivers with a system rated sensitivity of 91 dB with a 41Hz to 22KHz response. Now, ask an single 8" subwoofer to keep up with this system in a 1710 cu ft room playing 40Hz and under bass fundamentals and harmonics. Even at moderate level, having an advanced large stroke and surface area, (larger sub, dual subs, etc) , mated with power will help with clean transient response and reduced power compression. Yes, smaller subs have less mass but a modern advance motor larger subwoofer is not "slow" by any means. Keep in mind that two 8" drivers have the surface area just shy of a 12" driver. Live music has several low fundamentals and harmonics that are present but are not loud at all. Martin Logan's own flagship subs the BalanceForce products are great examples of capable subs (Dual opposing low distortion, high excurstion drivers, high power class D amps, DSP, room correction, custom low-pass filters) that can play the low stuff clean yet keep up. Yes, they can shake the walls but they should be seamless and disappear while playing at moderate levels. I was seriously looking at that Rythmik L12 today but I can get the ML Dynamo 700W (10") for $339 shipped refurbished w/warranty and if I buy it today can get 10% Ebay bucks. That's basically $300 shipped vs almost $250 more for the Rythmik. Add in your own high level to low level adapter. Here are just a few that are available. Some of these like the JL Audio can possibly can be used with a 12V supply. OK...I really appreciate your help...thanks! I opted to go with the ML Dynamo 700W and I'll likely pair it with the Russound ADP-1.2 you linked. Well, screw that idea. Russound doesn't recommend using their adapter with Class D amps (my amp is a PS Audio S300). In fact, and evidently, many subs with speaker level inputs can have grounding issues when connected to Class D amps unless you do a tweak or two. Well... get in contact with Paul or one of the tech guys at PS Audio to get their feedback on the way to ground. There's a way around this in many cases without noise or issues. What preamp do you have? The thing is, some subs that have speaker level inputs build-in may have to have a ground connection from a class D amp. It has everything to do with class-D and not the converter. I have 2 sets of outputs on my EE Minimax pre so I'll just have to do it that way.